91% of businesses in the Southwark and Lambeth councils have voted to expand the WeAreWaterloo business improvement district (BID) to include London South Bank University (LSBU) and its surrounds. The expansion of the BID will greatly enhance links between the University and the local business community. 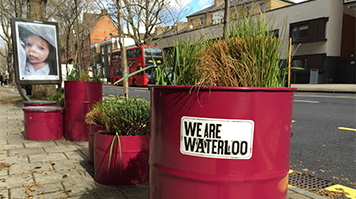 WeAreWaterloo is an organisation led by 400 businesses to regenerate the area south of Waterloo Station and boost its economy. Over the next five years, the district will undergo a variety of changes, including new restaurants and hotels, new housing and a renovated station. As an official member of the WeAreWaterloo BID, LSBU will be able to further support local businesses and help transform the lives of South Londoners. The University’s Research, Enterprise and Innovation Department already supports students and graduates to start their own businesses and intern at local SMEs. The Department also runs free business support initiatives for local businesses, such as the Momentum accelerator programme and the Business Solutions Centre, a drop-in business advice service staffed by students. LSBU’s campus is also home to 65 local businesses as well as student and graduate led start-ups. The award-winning Clarence Centre for Enterprise and Innovation is the University’s hub of entrepreneurial activity and has already been recognised for its role in regenerating the local economy. The Centre also houses the Legal Advice Clinic, which provides free legal advice to local residents. “WeAreWaterloo is excited about developing the potential of its new partnership with LSBU. There is significant scope to create links between local businesses and the University, through alumni networks, business support programmes and careers advice. Through our new business incubator on Westminster Bridge Road, we will aim to develop links with the University’s work in the architecture and built environment sector, promoting Waterloo as a hub for sharing knowledge and best practice and improving accessibility to the sector,” said Helen Santer, Chief Executive of WeAreWaterloo. “Last year, LSBU supported 594 London-based small and medium-sized businesses. As members of the WeAreWaterloo BID, we will be able to build upon our great work in boosting the local economy and helping to regenerate the Southwark area,” said Professor Paul Ivey, Pro Vice Chancellor for Research and External Engagement at LSBU.